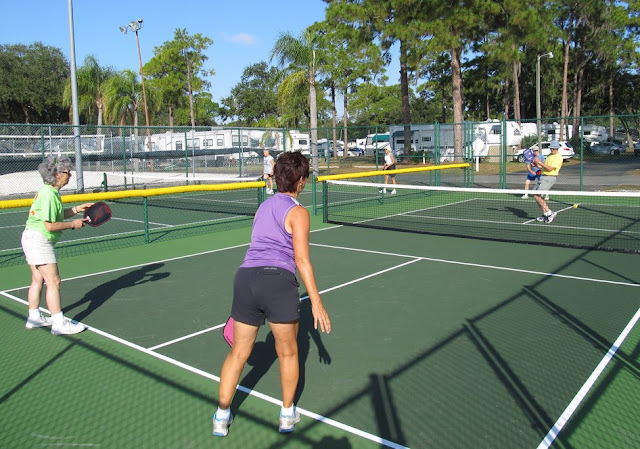 Pickleball thrives at Sun-N-Fun (SNF) RV Park and Resort in Sarasota, FL. 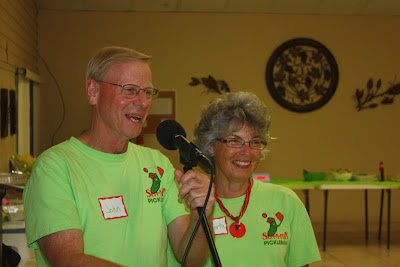 John and Roberta Hirth, affectionately known as Mr. and Mrs. Pickle, are the driving force behind the tremendous growth. Koenig, a retired physician, rigged up some nets, put down some chalk lines on the cement floor of the pavilion and encouraged folks to give it a try. The Hirths, who spend 6 months of the year at SNF, got behind the sport at SNF in 2008 and pickleball really blossomed. They developed schedules, organized events and just recently drafted plans for additional courts to submit to management. 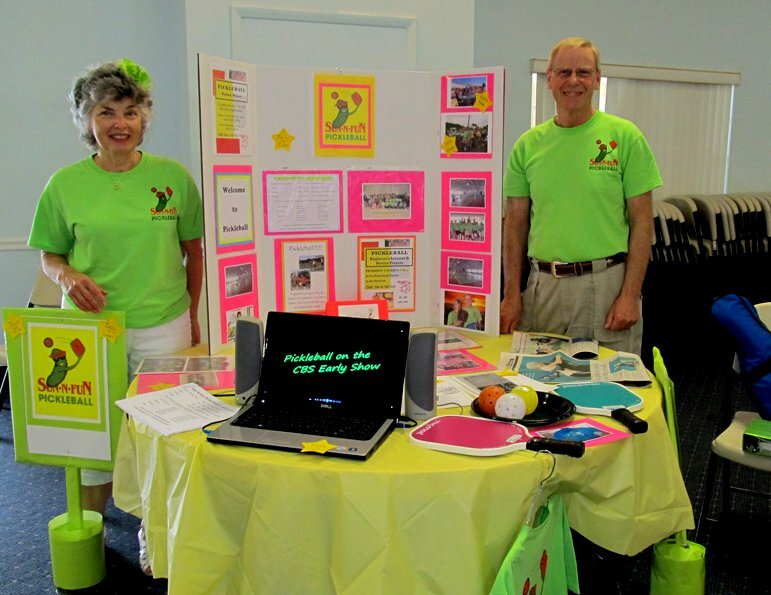 With a cadre of other volunteers and the support of SNF management, SNF has become a destination for pickleball. In addition to those three original courts, which now have painted lines and official nets, there are six new dedicated outdoor courts. Volunteers hold a clinic once a week for beginners, so that new players can become comfortable before heading out to the open social play where players of varying abilities have the opportunity to play together. Open social play for all ability levels is scheduled four mornings a week; one morning a week is set aside for advanced play, one afternoon each week is reserved for ladies social play and one evening, under the lights, for social play. 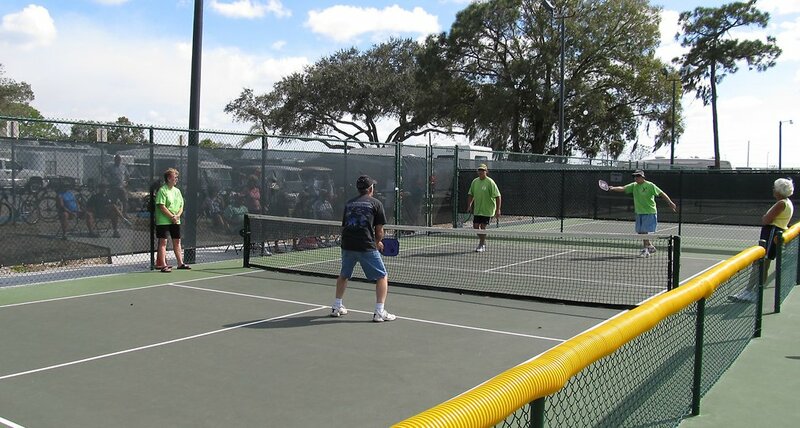 In addition to the scheduled play times, everyone is invited to use the courts at other times as well. Supplied by management, there is plenty of quality equipment available. The 2008 roster had 71 names when the Hirths took over from Jack Koenig. In the four years from 2009 through 2012, 605 new players have been taught at the beginner clinic – 196 in 2012 alone. There were 272 people registered to play in 2012, almost exactly half men, half women as has been typical. In addition unofficial tournament play was initiated in 2011. 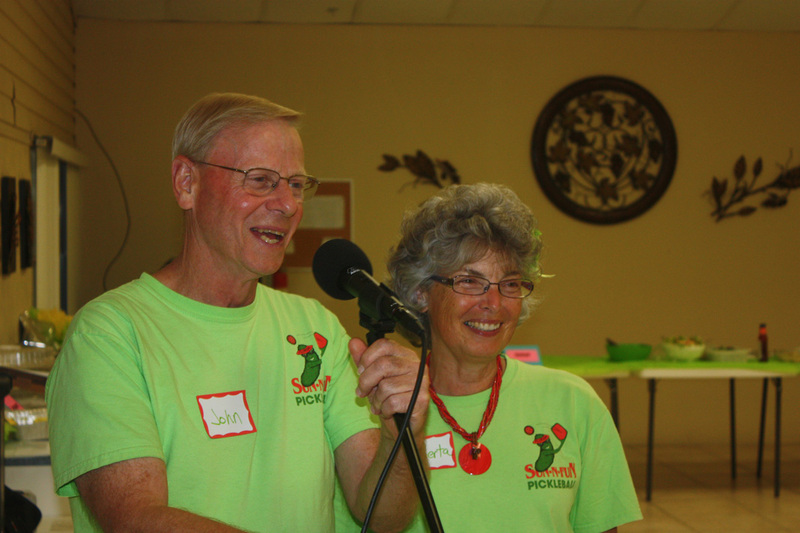 The second SNF unofficial annual tournament was held over Valentine’s Day this year with Mr. and Mrs. Pickle as Tournament Directors. Twenty-two teams played 15-point doubles matches in two divisions, each in a separate double elimination format. Gold, silver and bronze medals were awarded to the top teams in each division at a Potluck Dinner following the tournament. Interestingly, five of the twelve medalists first learned to play pickleball just this season at SNF. While not “official” ambassadors of the USAPA, The Hirths epitomize the role of the ambassador. With the help of many other volunteers and support from management, they have created an inclusive environment for players of all ability levels that encourage sportsmanship, camaraderie, skill development and fun.